Click the button below to add the Funlux 4 Channel 720P NVR Security System with 4 Bullet Network IP Cameras to your wish list. 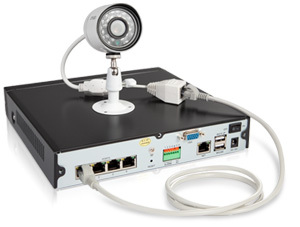 This All-in-one four channel NVR kit allows 4 outdoor 720P cameras to connect and set up in just minutes. You don't need to know deeply about computer or network, this time we've made the setup even more simpler. Four out of five people know how to live view on the Smartphone in minutes. No extra power cables or adapters are needed for the included IP cameras.Just plug one cable for one camera, scan the QR code, you will instantly view on your iOS or Android device. Connecting the NVR to your favorite devices is made even easier with the all new QR-Code security technology. 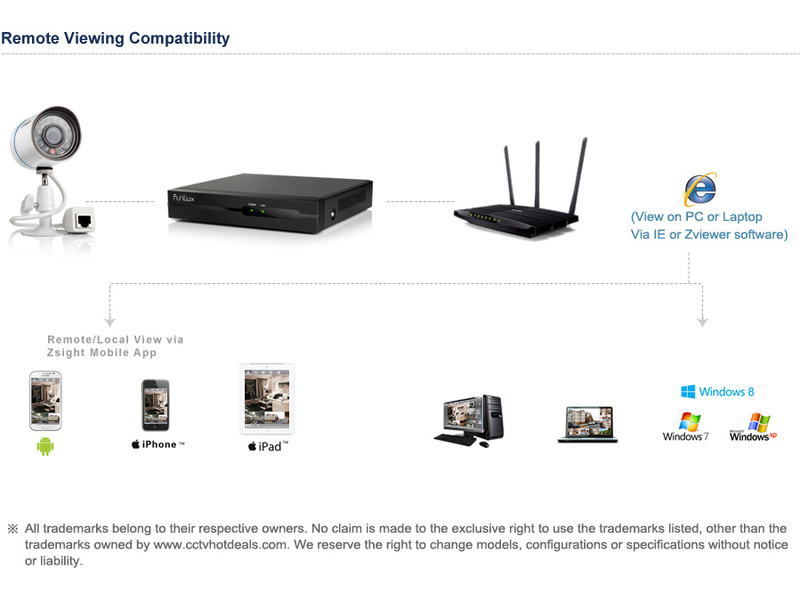 Simply connect your NVR to the cameras, download the free "Zsight" app, and scan the QR code located on your NVR. Then let the app do the work, allowing you to connect your system in seconds to your compatible iOS or Android Device. No more confusing port forwarding or making adjustments to your router settings. It’s as easy as A, B, C.
This kit includes four cables in two kinds of length (2 in 50ft, 2 in 80ft) offering you the flexibility to customize the layout. You can even purchase up to 165ft length of Cat5e Ethernet cable to extend the transmit distance. These cameras are equipped with a fixed 2.8mm wide angle lens, which provides a 81° diagonal field of vision to see more areas of the scene. With the four cameras being set in the important spots, you can easily cover the whole scene of your home and your shop. i had an older zmodo system. i got this one to replace it. i had to run the new network cables, but it was pretty easy since i already had cables run for the other cameras. the old system was a bit difficult to get online. you had configure your router, and a bunch of other settings. this one is as easy as downloading an app, and scanning a barcode.. genius! bottom line, it's worth every penny..